One Ukrainian serviceman has been killed and another two have been wounded in the area of fighting in eastern Ukraine in the past 24 hours, Ukrainian presidential administration spokesman Andriy Lysenko said. "One Ukrainian serviceman has been killed and another two have been wounded as a result of fighting in the past 24 hours," he said at a press briefing in Kyiv on Friday. The heaviest fighting was recorded in the Avdiyivka industrial zone, he said. "Intense strikes on the part of the adversary continued non-stop for ten hours both at daytime and nighttime," Lysenko said. Militant forces used artillery weapons of different calibers and systems, a circumstance which suggests the simultaneous presence of several batteries near the frontline, he said. "The number of ammunition launched from heavy weapons exceeds 100," Lysenko said. Militant units once again fired 152mm artillery weapons on the rear area, he said. "This time, it was the village of Arkhanhelske of the Yasynuvata district [20 kilometers from the frontline]," Lysenko said, adding that over 100 projectiles had been launched in two series of strikes before dawn. Strikes were also recorded in the village of Luhanske, near the town of Horlivka and at the Peski-Opytne section of the frontline, where mortars and armed hardware were also used. A total of 18 instances of shelling, including 10 strikes from heavy weapons, have been recorded in the Donetsk region in the past 24 hours, Lysenko said. Two nighttime strikes took place in Stanytsia Luhanska in the Luhansk region. The militants used armored vehicles during the first strike, and a mortar during the second attack. 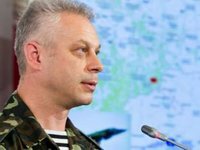 Militant forces were traditionally most active in the Popasna district, where the ceasefire was violated at several sectors of the frontline, Lysenko said. "Unlike previous days, heavy weapons were used this time. The adversary has conducted a total of nine strikes, including one mortar strike, in the Luhansk region in the past 24 hours," he said. Intense fighting continues at the northernmost point and in the south of the Mariupol region - in the Maryinka district and at the Pavlopil-Shyrokyne section of the frontline, he said. "The adversary is actively using mortars in both areas, mainly at nighttime. Ukrainian armed forces are returning fire. It is Maryinka [including a local checkpoint] and the neighboring areas that saw the largest number of the enemy's strikes. The enemy conducted 21 strikes, among them five mortar strikes, in the Mariupol region yesterday," Lysenko said.